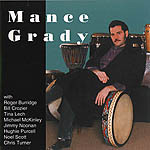 The following notes describe the tracks from Mance Grady's self-titled album released in in 1995 and gives a bit of background and significance for each one. Here we depart from the usual by starting with a reel and going into a jig (written by Roger Burridge) and finishing with a reel. Memories of his travels make their way into Hughie Purcell's vocals in this Ewan MacColl classic. Chris Turner, 1975 European Harmonica Champion, lends his extraordinary talents as you will hear throughout the album. Our goal was to keep it pure, simple and honest in our interpretation, instead of burdening it with track upon track trying to texture the life out of it. I think these tunes are proof positive that sometimes three tracks can speak volumes. This is the first of two improvisational pieces between Chris and myself. The more unusual the rhythms, the more challenging the piece. We love it! We came up with the name for this piece because of the Baltic kind of feel that just happened. These reels are beautifully played by Roger Burridge. The emphasis of this album was to let the strength of the bodhrán shine by allowing the strengths of each player to come through. It's great to work with musicians that are also friends. I think it brings a warmth and energy that can't be conjured up. Here, Tina really shines. I've worked with Bill while we were members of the Erinoids back in the early 80's and on Michael McKinley's album The Executive Session. Always a pleasure. Chris and I first met in the late 70's when we were part of the Nee Ningy Band. His virtuosity on the harmonica is once again embodied here. Again with Jimmy on flute, Noel on box and myself on bodhrán, the intensity comes through when we play together on this set of tunes. This song really takes me back. Chris sang this song when we were in the Nee Ningy Band and here he does it again. It's my way of paying homage to my roots. This Bluesy piece was actually the first improvisational piece Chris and I recorded for the album. We went in without rehearsing and got it in one take. I think it's the first improvisational duet between bodhrán and harmonica that has ever appeared on a recording. Hughie is originally from Dublin, and this is his interpretation of 20th century immigration written in with a Latin American feel. This is a favorite of ours and I wanted Hughie to do this one for my album. As an artist, Hughie deserves his right of interpretation any way he sees fit. In 1983 I lost someone I loved a great deal - my grandmother, who helped raise me. A great emptiness came over me and I put down my drums. It was some time before I heard any traditional music, and when I did it was the tune Christmas Eve. Upon hearing it, my joy in the music was reawakened. The Bodhrán Solo is dedicated to my grandmother in remembrance of the strength, support and love she had given to me.